The electrochemical behavior of acridine molecule and its interaction with dsDNA were studied on the hanging mercury drop electrode (HMDE) using cyclic voltammetry (CV), chronoamperometry (CA) and electrochemical impedance spectroscopy (EIS) techniques. In dimethylformamide (DMF), diffusion limited, two- one electron reduction steps were seen. 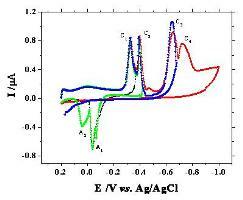 The electrochemical measurements indicated that the reduction of acridine followed an EC mechanism. The diffusion coefficient D was calculated using CA to be Dacridine = 1.6 × 10-6 cm2 s-1. Measuring the kinetics of the electrode reaction were done using the theory developed by Nicholson , the value of standard heterogeneous charge transfer rate constant, ko was 0.0375 ± 0.001 cm s-1. In Britton buffer solution, acridine can undergo reduction in a pH-dependent mechanism. In acidic media, four irreversible charge transfer reaction steps were observed whereas, by increasing the pH, two reduction processes were occurred. The voltammetric methods were used to probe the interaction of acridine drug with dsDNA. When DNA was added to the solution, the electrochemical signal of acridine decreased, shifted to more positive potentials and cathodic wave at - 0.5 V was split into two peaks. Under the conditions of pH 5, the complex of acridine- DNA was characterized and binding constant value of ßs = 1.99×104 mol-1dm3 was determined.